Google Analytics is a free web tool which gives you a wealth of information about your website visitors, including where they’re from, how they find your website, what pages they visit, how long they visit, along with a ton of other information. Integrating your Formilla.com account with Google Analytics will give you a better understanding of how visitors are interacting with Formilla on your website. If you’re not using Google Analytics on your website, it’s really simple to install and you can find out how to set it up by clicking here. 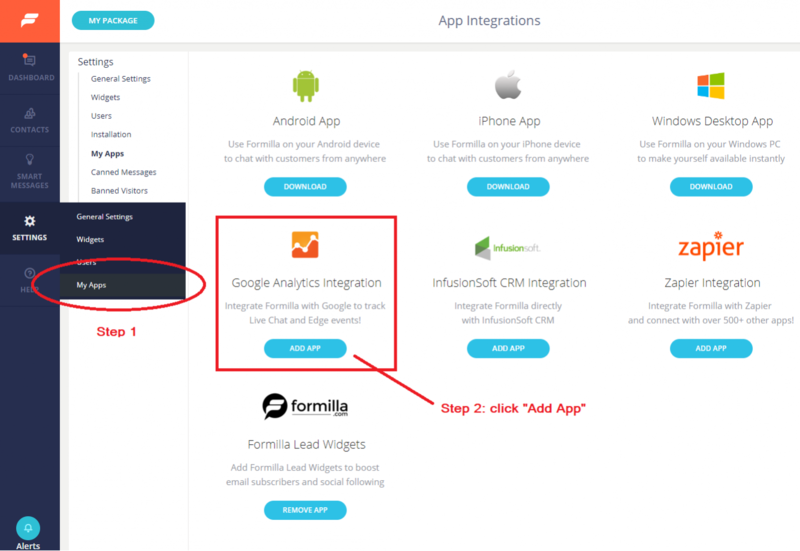 Note: Google Analytics integration currently supports one account ID, so if you have live chat installed on multiple websites, the statistics will roll up into one total summary for all sites. Also please note that if you’re using Formilla with a Wix website, Google Analytics integration is not supported. Users with Premium Plus accounts are able to utilize the Google Analytics integration with Formilla.com. Login to your Formilla dashboard and mouse-over “Settings” from the left menu and then click “My Apps” from the sub-menu. You will see a few apps. 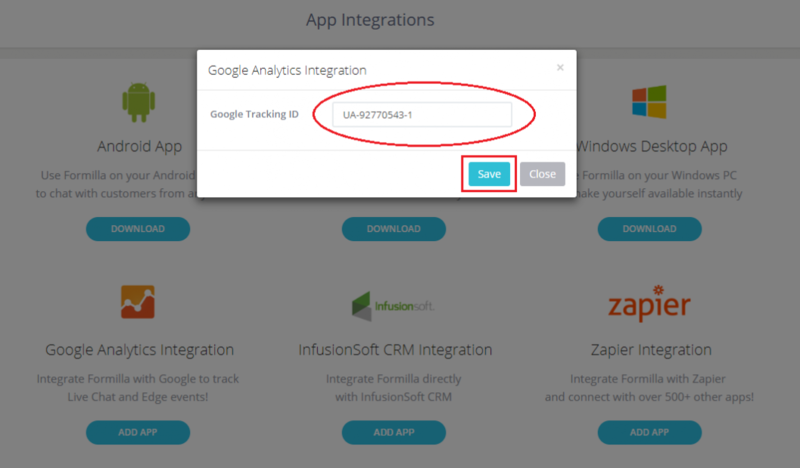 Click on the “Add App” button below the Google Analytics logo and text. 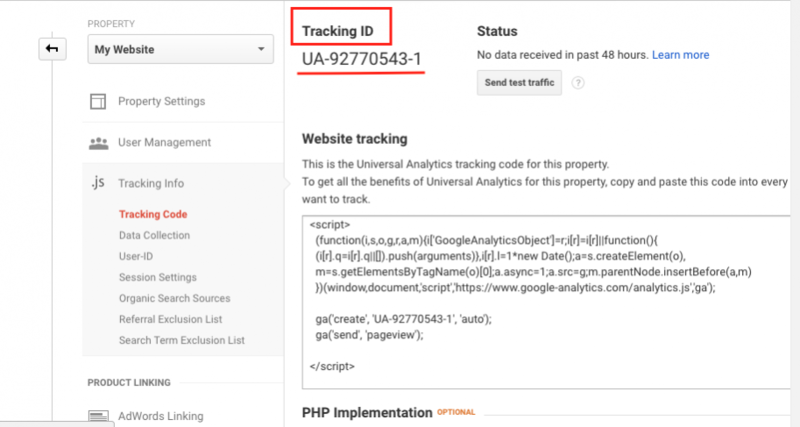 Copy and paste the text under “Tracking ID” — which usually starts with “UA” — into your Formilla account. Once complete, press, “Save.” Now you have successfully integrated Google Analytics with your Formilla account. Upon adding and configuring the app, you’ll start to see the following Formilla events inside of your Google Analytics account (assuming they occur) by navigating to Behavior –> Events –> Top Events –> and select Formilla_Chat or Formilla_Edge. A visitor clicked the chat button on your website which opened the online chat widget popup. A visitor clicked the chat button on your website which opened the offline chat widget popup. A visitor on your website started a chat by sending a chat message. A visitor submitted at least their Email Address or Phone Number to start a chat. A visitor and chat agent exchanged at least one chat message each, resulting in a conversation. The system displayed a Chat Smart Message (proactive chat) popup to the visitor on your website. The Smart Message name will be included with this event. A visitor sent a chat message in response to a Chat Smart Message (proactive chat) popup. The Smart Message name will be included with this event. A visitor clicked a link on your Chat Smart Message (proactive chat) popup. The Smart Message name will be included with this event. An agent clicked ‘Request Chat’ from the dashboard, which resulted in the chat widget pop-up displaying to the visitor. Ex: Hello, how may I help you today? A visitor sent a chat message in response to a chat agent’s requested chat. The system displayed an In-App Smart Message (popup) to the visitor on your website. The Smart Message name will be included with this event. A visitor clicked the button (CTA) on your In-App Smart Message (popup) or an HTML link within the message body. The Smart Message name will be included with this event. And there you have it! Anytime a visitor interacts with your Formilla widget/s, you’ll be able to keep track of events, and analyze trends to see what works best for your website.